Ripe peaches and Moscato sparkling wine make a deliciously fresh and light Bellini summer sorbet. A couple summers ago dining with friends at Zazu in Santa Rosa, I spotted this recipe on the wall. I snapped a picture of it, so I could try it during peach season. Duskie Estes and John Stewart, the chefs of Italian inspired Zazu, are known for their way with pork and Black pig bacon. But they also make crazy-good wood-fired pizzas, seasonal pastas and desserts. Technically, a Bellini is made with white peaches and prosecco, the light and fresh tasting dry sparkling wine from the Veneto. (Click to read more about prosecco on The Bubbly Girl.com.) This recipe features Moscato d’Asti, another popular Italian sparkling wine that’s sweeter and less bubbly. 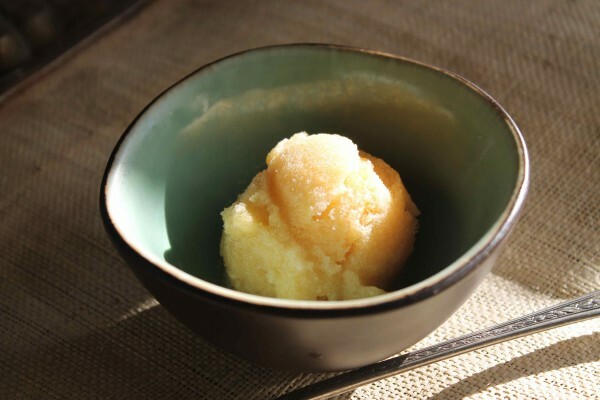 Since Moscato naturally and has flavors and aromas of peaches and apricots, I’m guessing that’s why the Duskie and John chose it for this sorbet. They suggest their favorite Bonny Doon Moscato del Solo, but it can be made with any good quality Moscato. 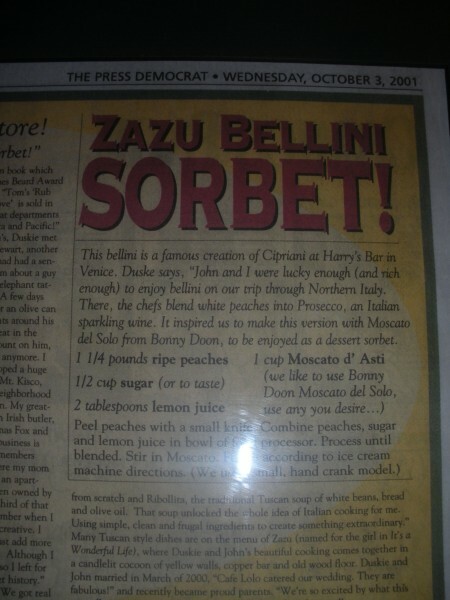 I spotted this Bellini Sorbet recipe on the wall at Zazu Restaurant in Santa Rosa. Peel the peaches with a small knife. Combine the peaches, sugar and lemon juice in a food processor bowl. Process until you have a smooth purÃ©e. Stir in the Moscato. Freeze in an ice cream maker according to the manufacturer’s directions or freeze in a shallow pan and fluff up every hour or so using the granita method. Recipe courtesy John Stewart and Duskie Estes of Zazu Restaurant.